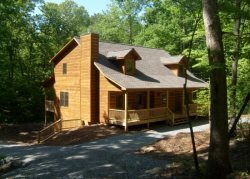 Mountain Resort Cabin Rentals- River_Daze - Coosawattee River Resort. 3 Bedrooms, 2 1/2 bath. Sleeps 10 Guest. Welcome to "River Daze" Located in the Coosawattee River Resort in Ellijay, Georgia. "River Daze" is a Beautiful Brick House overlooking the Coosawattee River. This house features 3 bedrooms and 2-1/2 baths with RIVER VIEWS from the Kitchen, Dining Room and Living room. The Hugh Screened in Deck is over looking the Coosawattee River with "Lots of Seating" - Rockers, Porch Swing, Benches, a Table and Chairs. There is a fully stocked kitchen with dishwasher, coffee maker, blender and other appliances. A wooden dining table seats 8 guest. The living room has a 40 inch flat screen TV, a gas burning fireplace, couch, over size chair and 2 recliners. There is a river view from the living room. The Master Bedroom is on the main floor. It features a King Size Bed, a Full Size Day Bed with trundle and a wall mounted 36" Flat Screen TV. The second bedroom is upstairs with a King Size Bed and a 32 inch flat screen TV. The third bedroom is also upstairs with 1 Queen Bed, 1 Full bed, and a 30 inch Flat Screen (MOVIES ONLY) DVD player. Outside Covered Deck with Hot Tub facing the river. * Rental Rate is based on up to 4 guests. Each additional guest is $10.00 per night / per person plus tax. GUESTS MAKING A RESERVATION MUST BE AT LEAST 28 YEARS OLD. BY SUBMITTING THEIR RESERVATION THEY ARE CONFIRMING THAT THEY ARE 28 YEARS OLD OR OLDER. NO LARGE GROUPS OF GUEST UNDER 28 YEAR OLDS. MAXIMUM OF 6 GUEST WHO ARE UNDER 28 YEARS OLD IN ANY CABIN. * No Check-In allowed on Easter Sunday, Labor Day, Memorial Day, 4th of July, Thanksgiving Day, Christmas Day or New Year's Day.